You cannot be too careful when approaching a highway-rail intersection. The circular warning sign is located ahead of the crossing. It indicates that you should slow down, look, and listen. At the railroad crossing you will see the white crossbuck sign. It is a regulatory sign that has the same meaning as a yield sign. If a train is approaching, you must yield the right-of-way. Remember, trains always have the right-of-way. They cannot swerve, stop quickly, or change directions to avoid a collision. 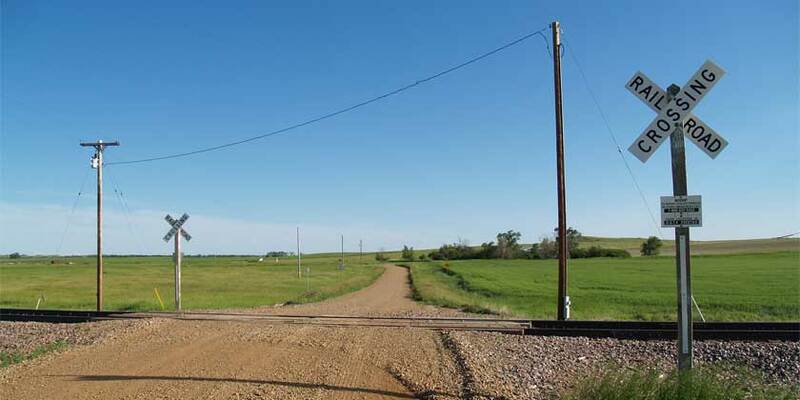 A passive crossing is a crossing with no signals or gates that stop you if a train is approaching. You will often just see the Crossbuck sign and an indication of the number of tracks (if more than one). Research shows that many road users don’t understand the regulatory meaning of the Crossbuck sign. This is why you will see additional signs at passive crossings in the future. By 2019, all passive crossings will have either an additional yield sign or a stop sign. 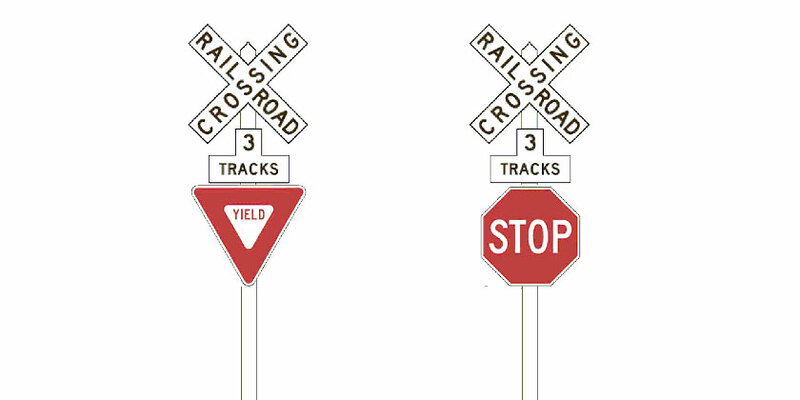 Crossings that require a stop probably have the additional stop sign already, but yield signs are not that common. Expect to see more of them in a near future. Even if there isn’t a stop sign at a crossing, you must come to a full stop at a crossing if a train is approaching and is close enough to be a hazard. You must also come to a full stop if a flag person signals you to stop, if red lights are flashing, or if a crossing gate is closed. You stop at least 15 feet (about a car’s length) from the nearest rail. Driving around a gate that is not fully up is illegal, even if red lights have stopped flashing. Remember, some vehicles are required to stop at all crossings. These vehicles include passenger buses, school buses, and vehicles carrying hazardous loads. Stop signs and yield signs at crossings by Xzelenz Media. Be the first to comment on "What Does the Crossbuck Sign Mean?"